By now most of you have caught on that this isn’t a technical photography blog, but that I’m not above putting out a little know-how if I think it could be useful. 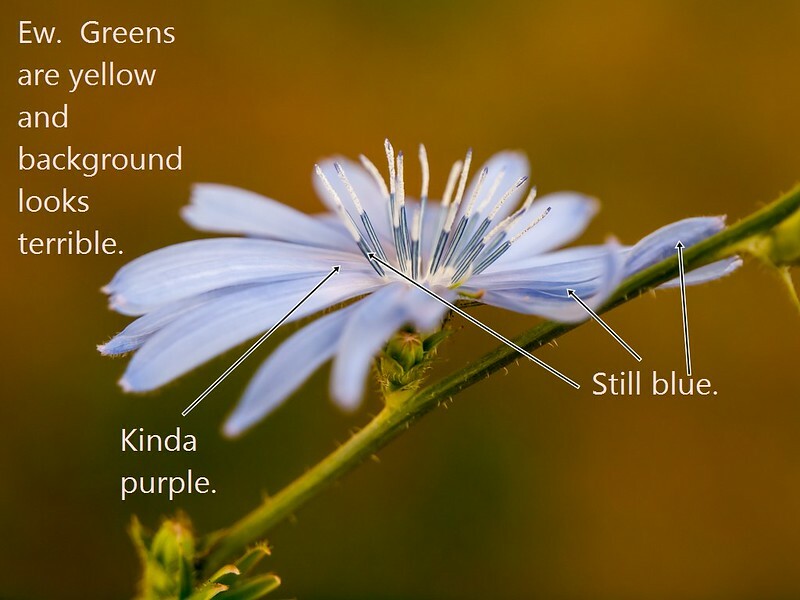 With wildflower season approaching, I think you flower shooters will like this one – purple flowers looking blue and how to fix it! 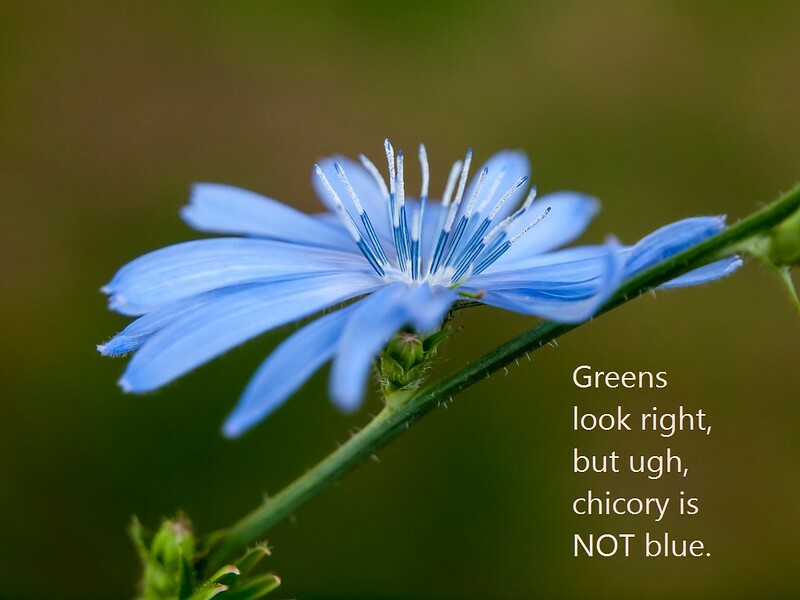 This drives me crazy and I’ve actually gotten into arguments with people about it, with them usually insisting the flower actually was blue. Uh, no folks it wasn’t – they’re called violets, not blues ok? That’s a different topic though – what we’re going to tackle now is a wicked easy way to color correct your flower pictures. Now, without getting all techy on you a hell of a lot goes into managing color in digital photography and I’m not going to get all preachy about it. Let’s assume you have calibrated your monitor to the best of your ability. Let’s take it as read that you’ve selected the proper white balance when you were shooting. Still have blue flowers? It’s not your fault. It’s the sensor. In a nutshell, digital sensors have a difficult time seeing, rendering and processing purple and often put out pure blue instead. If you want the techy reasons Google is your friend and there is no shortage of articles about it. Even film had trouble reproducing purple accurately. Mostly it has to do with the color purple itself being made up of red and blue, two colors on opposite ends of the color spectrum and digital sensors, even very modern ones, have trouble. It’s been a thorn in our collective sides for years. A quick Google search pulls up a ton of people asking why their purple flowers look blue. I find it’s most obvious when shooting in the shade, which, let’s face it, is where a lot of us prefer to shoot wildflowers. Harsh sunlight is not our friend. Shots in sunlight are more accurate, but often can be a bit off, too. Some people also report that using an IR or UV filter makes the problem more extreme, so if you’re using one on your camera, remove it when photographing purple wildflowers. 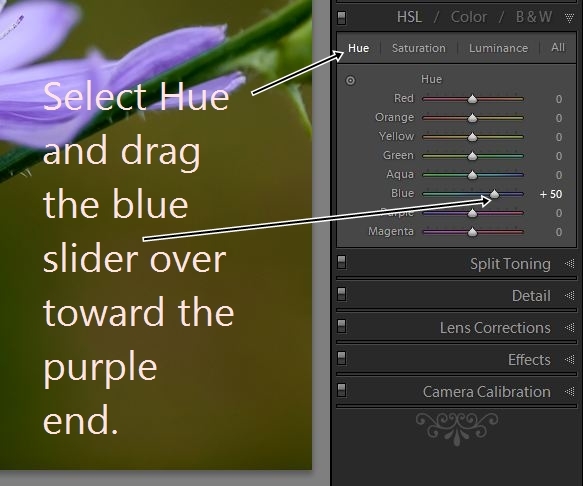 The quick and easy fix for this lies in your HSL panel (I’m using Lightroom, but many other robust editors also have this functionality, you just need to find it). Each color has a control with the cool end of the the range to the left and warm to the right. To make blue purple we need to increase the amount of red which means sliding to the right (warm). How far you drag your slider depends on how off your color is. You could also use the targeted selection tool (that little bullseye under Hue) and put your mouse right on the blue color and then use the arrow keys to make the adjustment, but it’s not necessary for most shots where the color you want to change is clearly differentiated. You eagle-eyed folks will have spotted some chromatic aberration where the purple and the green meet. I’ve found this occurs fairly often with this combination even with lenses that don’t throw color aberration at any other time. Yep, there’s a wicked techy explanation for it, but I won’t give it to you here (Google is your friend if you want to know why). Using LR 3 I could probably correct this, but Adobe in their wisdom decided to make this correction tied to lens profiles only in LR 4 and they can’t be bothered to include a single piece of Olympus hardware in their application. Thanks guys. I love being given short shrift. But anyway, you folks with mainstream cameras can probably fix this easily. 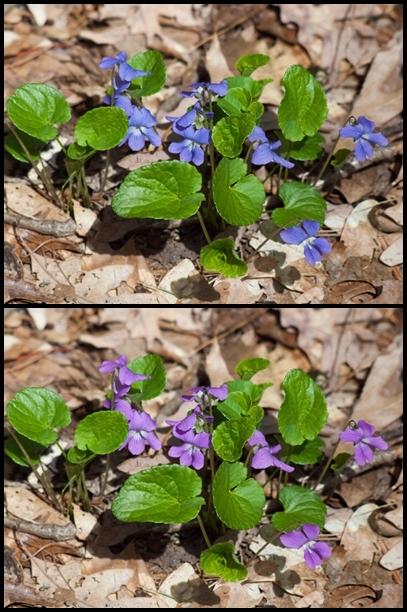 Here’s one more comparo for you and it really shows why they’re called Violets and not Blues (and how even in bright sun digital sensors can be confused by purple). All I did was adjust the hue and luminance values with the blue and purple sliders and although that makes it seem like I adjusted the green channel, I didn’t. Scout’s Honor. That wasn’t so bad, was it? Easy peasy. Use the technique with that other bane of the digital sensor – magenta and dark pink. It never looks right out of the camera and it’s always HSL panel to the rescue! I should pay attention to this. I usually don’t process for days after I shoot, and I don’t know the flowers enough to remember if they were blue or purple when I’m editing. I’m sure I’ve screwed them up pretty often. Thanks Ed. I forgot to mention that I sometimes use an Audubon guide to identify the flower and then have a look online to see what the consensus in color value is. It’s a good start to jog the memory anyway! very interesting… I have run into this problem pretty often when I used to take a lot of flower photos. Luckily I usually know what color the flower was supposed to be (wild flower dork like that) so if I can’t get it back to normal I just ditch it. Great tips though I will keep them in mind. Thank you! Very simple & helpful. Very helpful Kris. What I really want t know is, how do you get the text on the photo? I been thinking of doing, and have had a few requests for, a few “How I Got This Look” article on my blog. After I process in LR, I export a jpg and then open it in Photoscape, a free and not bad photo editor. It has all kinds of other stuff you can do, too, like pasting two shots together, collages etc. if you go to Cnet, you can find it. I’m glad you found this helpful and I’m looking forward to reading yours. We should really go shoot sometime, too. Yes! It has been to long. This Dover thing I’m working on is finally winding down so I can think about taking photos of something other than things in Dover. I’m going to look into Photoscape. I love free software for photo editing! Thank you – I have the biggest headache trying to capture the blackish purple of a monkshood flower. This was very helpful. I’m glad you found it helpful. It used to frustrate me a lot until I got brave with Lightroom! I found you when I was researching purple/blue for portraits! I find it interesting and strange that when I photographed in studio a senior wearing his royal purple soccer uniform it showed royal blue in camera but in Lightroom it was fine!?? Different screens and video cards maybe. So many things make digital color rendering complex. Glad you could make it right though. YMMV. The shots in this article were all done on an Olympus E-30 and purple almost always needed correction. Now I shoot with a Panasonic Lumix GH3 and I never need to color correct. Wicked car btw; the color suits it. Looks like Grimace on wheels! This has been extremely helpful. Like you said, violets should be purple not blue. For color reference, if you have an iPhone take a picture first with it, before your DSLR, for some reason, the color is very accurate.